Welcome to Skipton Community Orchestra. The orchestra was set up in January 2012 to provide an opportunity for people to come along and play music together and hopefully make a reasonable sound! Seven years on, we are going from strength to strength…regularly welcoming over 30 musicians to each rehearsal. The emphasis, however, is on having fun – we just want everyone to enjoy the sessions and maybe learn something new along the way. Our conductor, Jess Mahler, is hugely inspiring, making rehearsals fun and entertaining, while managing to bring out the best in everyone. Don’t worry if you’re a bit rusty – blow off the dust and cobwebs and come and have a go! The orchestra meets twice a month in the evening. There is no need to commit to coming to every rehearsal – it is “pay as you play”. We play a variety of well-known classical pieces as well as music from musicals, TV and films, etc. Rehearsals are on the second and last Tuesday of every month (apart from during the summer) at Skipton Holy Trinity Church Vestry Rooms from 7.30pm to 9.30pm. It costs just 3.50 per rehearsal and includes a cuppa and biscuits! Please note, it is sometimes necessary to change rehearsal dates due to school holidays as our conductor is a teacher! 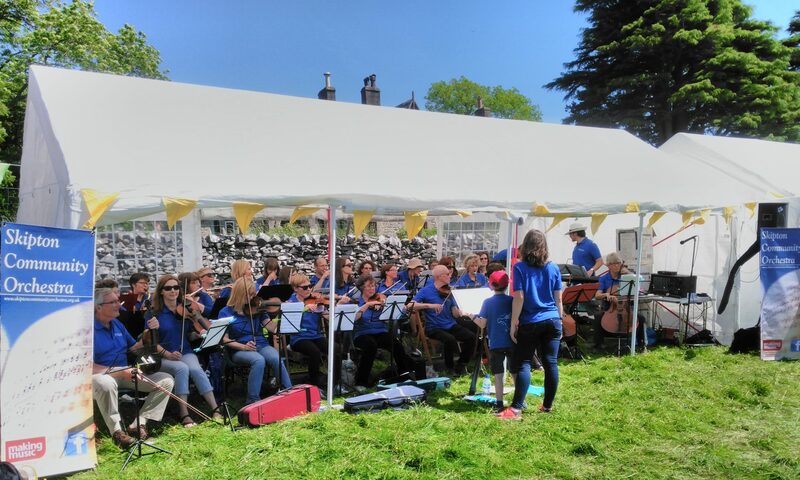 We have performed at a range of local venues and events over the years, including Grassington Festival in the Square, Buckden Gala, Celebrate Craven, Skipton Library, Christ Church School, Holy Trinity Church, Cliffe Castle, Keighley, Aireville Park Community Picnic. We never charge for our performances as we strongly believe that everyone should have the opportunity to listen to live, orchestral music. Our performances are very informal and are particularly suitable for young children, often with percussion instruments to join in with and an opportunity to try out instruments afterwards. If you would like us to play at a community event, please do get in touch. We usually need a few months’ notice to make sure that sufficient players are available and to give us some time to practise! Check back to find details of our next performance. We had a wonderful Christmas Concert on Sunday 9th December at Holy Trinity Church, Skipton. The orchestra was joined by members of SELFA, Skipton’s children’s charity, and raised over £400 to go towards their important work, supporting children and young people in the local area.